The border between Mexico and the United States is as much a feeling as an actual place. It marks a linear topography that has no true breadth save that which is created by all that occurs along its course. You perceive adjacency and distance differently when you are on the line: it crosses valleys, intersects mountain ranges, and cuts through cities and towns. Features and locations transition one to the next. This is simply the lay of the land, but abutment and overlap often make it seem like there is an ironic and capricious logic at work. Orientation in the desert relies on a process of scanning the horizon while simultaneously reading more immediate surroundings. The border seems to amplify that process. Functionally and abstractly it works as a limit, a phenomenon that is reinforced by map representations: the browns and greens of shaded relief, place names, and detailed geographic features simply end at la linea. Circumstance necessarily hinges on where you are and how you define “here.” On the ground, any abstract recognition of an edge diminishes as you get closer to the line, and then disappears. Even if you know roughly where the border is, it can be difficult to spot in the landscape from a distance, and then it seemingly materializes. It has to do with the way visual cues lead your eye. Whether defined by a dirt track, cattle fencing, or formidable steel and concrete interventions, once your view is roughly parallel with the boundary, its path across the land is more readily discerned. At proximity it also becomes clear that it is an imposition on otherwise contiguous space. There are no edges. 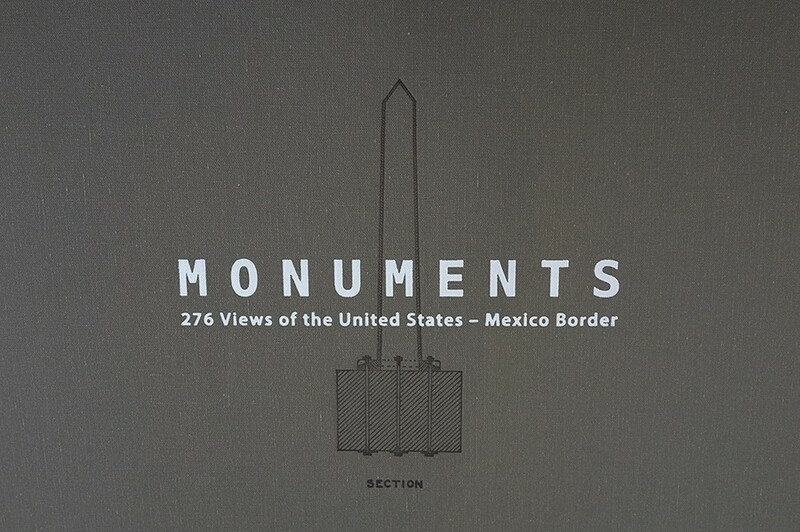 The western portion of the US-Mexico border unfolds in increments that can be measured by the distance between obelisks; 276 discreet sample points punctuate the land boundary between where it leaves the Rio Grande and where it reaches the Pacific Ocean. Often incorrectly called “mile markers,” the border monuments weren’t set on regular intervals. They were installed with the practical consideration of being visible from adjacent markers (though border fencing now obscures many of them). Placement was dictated by terrain, and most are spaced between 2.5 and 3.5 miles apart. Border Monument No. 1 sits on the west bank of the Rio Grande where the states of Chihuahua, New Mexico, and Texas meet. At the base of Mount Cristo Rey, which is crowned by a twenty-nine foot tall limestone crucifix, and across the river from the site of the now demolished ASARCO copper smelter, it is among the most iconic of border locations. Heading due west there are forty monuments that mark the boundary between El Paso-Juárez, a bi-national metropolis of 2.7 million people, and the New Mexico Bootheel. This first stretch of land boundary crosses mostly open country dominated by creosote bushes with the border towns of Columbus-Palomas falling at the mid-point. The towns are notable for Pancho Villa’s 1916 cross-border raid and cartel violence that compelled the Palomas chief of police to flee his post in 2008 seeking asylum in the United States. The next thirteen monuments mark the meridian boundary as it runs north-south between the Big Hatchet Mountains and the agricultural community of Colonia el Camello, Chihuahua. At Monument No. 53, the boundary runs west again to Monument No. 127. That stretch covers nearly 170 miles, crosses seven mountain ranges, bisects the cities of Douglas-Agua Prieta, Naco-Naco, and Nogales-Nogales, and takes you from the Chihuahuan Desert to the Sonoran. A region known as the Madrean Archipelago, the line divides territory of astounding biological diversity where you can gaze at a saguaro cactus from the shade of an oak tree. At Monument No. 127, the border trends northwest, an angle precipitated by a renegotiation of the line known as the Gadsden Purchase (1853). Situated in mountainous terrain, the monuments are spaced roughly a quarter of a mile apart, with 126, 127, and 128 all within easy view of one another, transcribing a bend in the frontier onto the land. Monument Nos. 127 through 204A run in a straight line that crosses some of the most remote, sublime, and fraught border territory. Look in any direction along that 233-mile diagonal section and you might be in view of, sovereign native lands, prehistoric occupation sites, a wagon route, unexploded bombs, or unobtrusive shrines adorned with Santos and filled with prayers for a safe passage to el norte. People who attempt to cross wait for dusk at layup sites on the Mexican side. Some will succumb to heat and dehydration when the sun rises again. A zone that’s archaeologically rich, the newest strata will be comprised of carpet booties, water jugs, cell phone cards, backpacks, and abandoned clothing. Monument No. 204A (the rebranded Monument No. 205) is in the city of San Luis de Rio Colorado. It’s a sizable place with 159,089 residents that abuts factory farms stretching west for fifty-three more miles. The city takes its name from the Colorado River, or what’s left of it. Diverted for irrigation and drinking water, it’s now a dry bed south of the Morelos Dam. Further north it is still a viable river, even though it’s hemmed in by levies. Empty or full, the river accounts for a short but busy seventeen-mile north-south section of the border. The route north to monument 206 abruptly leaves urban space and passes through a series of agricultural communities ending at Los Algodones, a small port town filled with taquerias, pharmacies, and dentists’ and doctors’ offices. There is only a half-mile between Monument No. 206 at the river and 207 where you can see the Algodones Dunes. Heading west again, the border is defined by nearly fifty-six miles of uninterrupted fencing. It cuts across the dunes roughly paralleling the All-American Canal that supplies irrigation water from the Colorado to the perennially green Imperial Valley and separates Mexicali-Calexico. The fence ends about 1.5 miles beyond Monument No. 223, and agriculture gives way to a stark twenty-mile expanse of the Yuha Desert where the line drops below sea-level and then gains 4,000 feet as it climbs into the Jacumba Mountains. In the 4.6 miles between Monument Nos. 230 and 231, the temperature gradient can exceed 25º Fahrenheit with the Sonoran Desert heat giving way to cooler air. Elevation and climate influence from the Pacific Ocean give the final fifty-nine miles of border a distinctive feel. It becomes a rocky landscape of otherworldly ruggedness interspersed with cienegas and oak groves; this section might be described as bucolic tectonic. Ranches and ejidos straddle the line amidst a chaos of granitic outcrops. At Monument No. 244A you reach the Tecate Port of Entry: gateway to an inviting Mexican town in the shadow of Kuuchamaa Mountain, known as Tecate Peak in the United States, and home to Mexico’s most popular beer. Another ten miles west in more secluded country is Monument No. 250, marking the entrance to the majestic Cañon del Padre and also the abrupt beginning of a 3.52-mile section of eighteen-foot-tall pedestrian border fencing that almost unbelievably snakes its way through the steep canyon and easily competes with any piece of land art you can imagine. Not far from the other end stands Monument No. 251 with a sweeping westward view. Reaching the location at dusk pays out the drama of a Pacific sunset fading into the patchwork illumination of Tijuana’s sprawling grid. The final stretch to Monument No. 258, at Playas de Tijuana, passes maquiladoras, residential neighborhoods, makeshift colonias, an international airport, customs facilities, the city centers of Tijuana and San Ysidro, a bullfighting ring, and a wildlife refuge. No. 258, the only marker made of marble and originally designated No. 1, presides over the end of the land boundary, where children play, tourists photograph, and Border Patrol agents watch. A 690-mile run-on sentence of topography, river to ocean: ecosystems full of flora and fauna, ports of entry, welcome signs, warning signs, border fence, vehicle barrier, electronic sensors, live feed cameras, the occasional gate, or nothing at all…and monuments.